During a recent event held at New Stanley Elementary school in Kansas City, Kansas, fifth-grade students Nicolas "Alex" Rincon, Diego Heraldez Dessens and Julian Bush were recognized as the winners of a contest for the design of an environmentally-themed wrap for an Elgin Pelican street sweeper purchased by the Unified Government of Wyandotte County/Kansas City. The sweeper wrap design contest was sponsored by Key Equipment & Supply Company, an Elgin Sweeper dealer serving the municipal and contractor market in Kansas, Missouri and Illinois since 1962. "We were amazed by the creativity and originality of the designs the students submitted. It really made the judging difficult," said Jeff Miles, vice president of Key Equipment & Supply Company. "But the artwork and messaging of the winning design really stand out." Mark Holland, mayor/CEO of the Unified Government of Wyandotte County/Kansas City, congratulated the students for their accomplishment during the event. The newly wrapped Pelican sweeper bearing the winning design and the slogans "YOUR Small Steps WILL Save the Environment," and "Throw YOUR Trash Away The CORRECT Way!" was unveiled to the school's entire student body. Steve Hyink, president of Key Equipment & Supply, and his team have developed sports-themed wraps for several municipal sweepers in recent years. 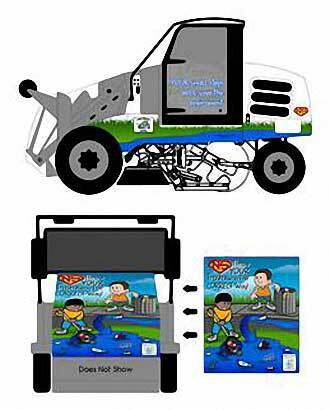 With approval from the United Government of Wyandotte County/Kansas City, Miles worked with Ryan Most, principal at New Stanley Elementary, to establish a design contest challenging the fifth graders to develop environmentally themed designs that would be used for the sweeper's wrap. 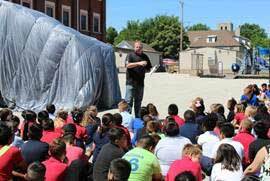 Jeff Miles, vice president of Key Equipment & Supply Company, addresses students at New Stanley Elementary school in Kansas City, Kansas, during a recent event to recognize the winners of a contest for the design of an environmentally-themed wrap for an Elgin Pelican sweeper. To kick off the contest in mid-April, Miles spent time with the students at New Stanley Elementary, teaching them about the importance of street sweeping in preventing pollution and helping the environment. He also showed the students photos of the Pelican sweeper and explained important details on how their designs would be applied to the machine. A total of 60 entries were submitted by students. Out of those entries, six designs were presented to the Unified Government of Wyandotte County/Kansas City to make the final choice. 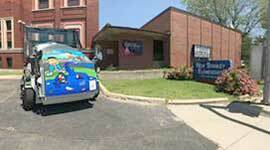 Mayor Holland combined two designs submitted by three students to come up with the final wrap design. 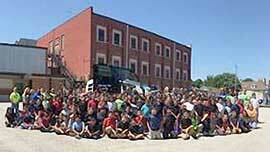 Students at New Stanley Elementary school in Kansas City, Kansas, gather around the Elgin Pelican sweeper bearing an environmentally-themed wrap designed by three fifth-grade students at the school. "Not only is this wrap visible to everyone as the Pelican travels along its sweeping routes, it's a source of great pride to the people in the community," Miles said. With approval from the Unified Government of Wyandotte County/Kansas City, Key Equipment & Supply Company worked with New Stanley Elementary to establish a design contest challenging fifth graders to develop environmentally-themed designs that would be used for the Elgin Pelican sweeperÕs wrap. The Elgin Pelican three-wheel mechanical sweeper is based on one of Elgin Sweeper's original street sweeper designs, which has been continuously improved since 1914. The Pelican easily handles heavy, compacted dirt and bulky debris found in the street. Key Equipment & Supply may be reached via the company's website, www.KeyEquipment.com. Sold and serviced through a network of more than 100 dealer locations worldwide, Elgin Sweeper products are the sweepers of choice for a variety of general street maintenance, special industrial and airport applications. With more than 100 years of experience, Elgin Sweeper offers municipalities, contractors and industries the most sweeper options in the country, using the latest sweeping technologiesÑmechanical, pure vacuum, regenerative air, alternative fuel and waterless dust control. Elgin Sweeper is a subsidiary of Federal Signal Corporation's Environmental Solutions Group. For more information, visit www.elginsweeper.com. World Sweeper All rights reserved.